With the upcoming crop season soon upon us, and the snow quickly disappearing off the fields, harvest isn’t always in the forefront of farmers’ minds. That being said, many farms have spent the winter cleaning out their bins and getting ready for the upcoming crop. With every trip to the elevator, good grain management practices are paying off in higher grades, and higher prices. ensure that the storage practices and equipment they are using to handle the grain are doing their job. When things do go awry, being able to see inside of the bin is key to dealing with an issue. An investment in bin monitoring equipment is a kind of insurance for a farmer’s grain. With any insurance policy, the level of coverage can be different based on the options chosen. However, as long as there is coverage when something goes wrong, the policy is there to help get through the best way possible, and limit the impact to a business. Unlike insurance, though, investing in bin monitoring not only protects farmers when things go wrong, it allows them to actively control the conditions before a problem arises. To ensure that the conditioning equipment is working properly, a set of temperature cables at the recommended spacing will make it possible to track the conditioning of the grain until it is at a safe temperature for long-term storage. For further peace of mind, a moisture cable will give an indication of the grain moisture content, and enable the use of the CGC life estimate curves to determine (based on tempera- ture and MC) how long the grain should last in storage. For those that want to go to the next level of grain management, integrating the measurements coming from their bins with commodity volume and quality data is a growing interest. Knowing, with accuracy, the history of how the grain in the bin has been taken care of, how much is stored there and what protein/oil content it contains allows for more focused, and profitable, marketing. As with any business, the more actionable data that is available, the better the decisions that are made. In anticipation of this year’s harvest, and all that it means for farms, AGI has proudly announced the launch of the Guardian Bin Monitoring System. 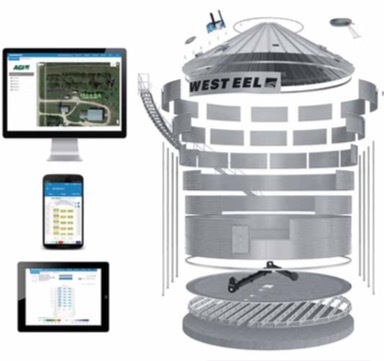 This complete grain bin management system incorporates all the monitoring solutions that farmers are familiar with, while pushing the boundaries of what is possible with bin monitoring equipment. For the farm that is new to bin monitoring, a handheld reader solution, with tried-and-true digital temperature monitoring cable technology, is the best option. This subscription-free system provides the peace of mind of knowing what is going on inside of the bin, without the yearly fees. As an upgrade from the basic system, a yearly Handheld Reader PLUS subscription allows users to save every reading and every load of grain in and out of the bin, and see it either on their phones or computers from anywhere in the world. In addition, the Guardian moisture monitoring cable offers faster reading, and extremely high levels of accuracy. This option keeps the hardware cost down compared to a remote monitoring system, but gives the convenience and oversight that a remote monitoring user enjoys. For those farms that are looking for an automated system that provides the bin data to them on a regular basis, to anywhere in the world, the Guardian Remote Monitoring solution is an ideal choice. With the ability to communicate between yards up to ten miles away (line of sight), to measure cables in bins up to a 6013, and monitor door switches along with the bin conditions, users can manage their grain, instead of just reacting to issues.